These CLEP* test preps are perfect for adults returning to college (or attending for the first time), military service members, high-school graduates looking to earn college credit, or home-schooled students with knowledge that can translate into college credit. There are many different ways to prepare for the CLEP* exam. What's best for you depends on how much time you have to study and how comfortable you are with the subject matter. 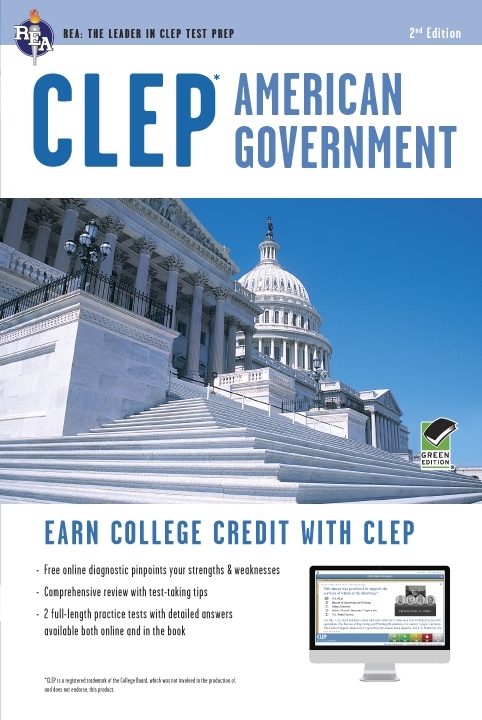 Our test prep for CLEP* American Government and the free online tools that come with it, will allow you to create a personalized CLEP* study plan that can be customized to fit you: your schedule, your learning style, and your current level of knowledge. Most complete subject review for CLEP* American Government. Our targeted review covers all the material you'll be expected to know for the exam and includes a glossary of must-know terms. The online REA Study Center gives you two full-length practice tests and the most powerful scoring analysis and diagnostic tools available today. Instant score reports help you zero in on the CLEP* American Government topics that give you trouble now and show you how to arrive at the correct answer-so you'll be prepared on test day.